This last week, we got a chilling perspective of just how corrupt the moral and intellectual foundation of Progressivism really is. We have the false narrative of Benghazi, which showcases a "fantasy" story of what happened the night of September 11th, 2012 and has yet to disclose the real truth behind our government's machinations in Libya.... any story will do as long as it continues the foreign policy spin that Al Queda was "on the ropes" and the Arab Spring was successful in spreading democracy across the Middle East. The American people must not know the truth so close to the election! The IRS scandal shows just how fixated the Progressives are on stifling expression by anyone who opposes them. They fancy themselves more enlightened than us "rednecks"; us "clingers". They effectively used Alinsky methods to intimidate and shut down those groups who still mistakenly revere the Bill of Rights and the Constitution, while stubbornly revolting against an ideology that promotes an agenda of "collective social justice". And they don't care if their methods are illegal or immoral; any means are justifiable as long as they end up getting the result they want. Shut down the Tea Party any way you can! And finally, there is the issue of the AP wiretaps. The Department of Justice, in full Progressive mode, loudly claims its rights to protect classified information, even if it means trampling on the First Amendment and the rights of a free press. Did they go through proper and legal channels to obtain the AP phone records, and did they take measured steps to narrowly define their subpoenas, so as not to be oppressive or punishing in their actions? That doesn't seem to be the way of Progressives. So now the DOJ and the Department of Education (DOE) seem to be emboldened by these tactics and have forged ahead with a new agenda against the First Amendment. It seems that a letter from these two agencies has been sent out to all colleges that receive federal funding, mandating the institution of "speech codes." The joint letter from the DOJ and the DOE was sent to the University of Montana in response to a year-long investigation by both Departments into the mishandling of several sexual assault cases by the University. The Progressives in the government saw the opportunity and took it. They used this investigation as the basis for broadening the federal government's rules about sexual harassment and free speech on campus. After addressing the University's mismanagement of the sexual assault issue, the letter went on to state that only a stunningly broad definition of sexual harassment—"unwelcome conduct of a sexual nature"—will now satisfy federal statutory requirements. This explicitly includes "verbal conduct," otherwise known as speech. Furthermore, in their standard modus operandi, they didn't let this "crisis go to waste". The letter also stated that because of what the DOJ and DOE were able to determine from the University of Montana case, their findings should serve as a "blueprint for colleges and universities throughout the country." In an Op-Ed written in the Wall Street Journal, FIRE President, Greg Lukianoff, stated, "By eliminating this "reasonable person" standard—which the Education Department has required since at least 2003, and which protects the accused against unreasonable or insincere allegations—the right to be offended has been enshrined in a federal mandate." He goes on to relate this disturbing fact, "The letter further states that campuses have "an obligation to respond to student-on-student harassment" even when that harassment occurs off-campus. In some circumstances, the letter says, universities may take "disciplinary action against the harasser" even "prior to the completion of the Title IX and Title IV investigation/resolution." In plain English: Students can be punished before they are found guilty of harassment." 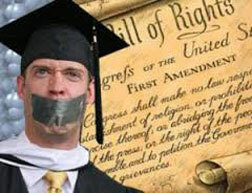 Whether it is the Common Core curriculum in our public education, or the idiocy of these "speech codes" on college campuses, it is obvious that Progressives are intent on lowering the standards of American Education and inhibiting the freedoms guaranteed by the Constitution. It's all about control and power. If a failed foreign policy narrative, or a competing political and social ideology, or even a Constitutional law gets in the way of furthering their agenda, then anything is on the table in order to reach their goal, which is subjugation of the populace. If you are the parent of a college-age student, how do you prepare them to safeguard their freedom of speech? Any university or college that attempts to fight back against this mandate is threatened with termination of federal funds. How can academic freedom continue to survive? I think we know the answer to the question; and that, my friend, is the real end game. 1 Peter 2:16 "Live as people who are free, not using your freedom as a cover-up for evil, but living as servants of God."